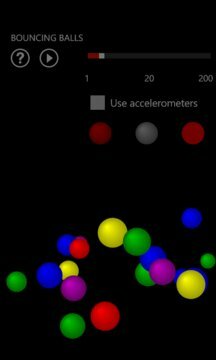 Bounce up to 200 multi colored balls on your screen. Set the number, press play, and you're away. The balls bounce using simulated gravity toward the bottom of the screen. The full version uses the phone accelerometer to bounce toward the low edge. You can also temporarily add an attractor in both versions, just by tapping and holding the screen. The balls will gravitate toward your finger. Great to keep the children and parents amused too. Watching the balls is strangely hypnotic and relaxing. Version 1.3 allows you to choose monochrome, 3D colors, or 2D colors. 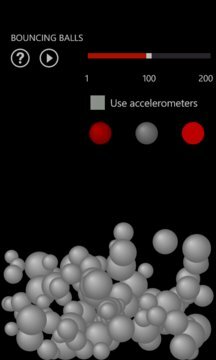 * in the full version using accelerometers, the balls are now constrained to the screen, and no longer bounce off the top. * When reverting from acceleromter mode, gravity is reset to point toward the bottom of the phone.